Best Countries to be a Social Entrepreneur? 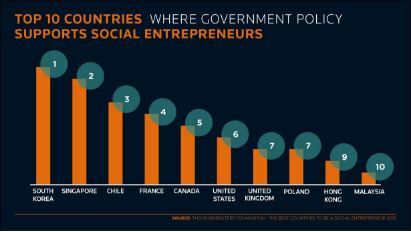 The findings of a global perception poll on the best countries to be a social entrepreneur have been released showing that while Australia failed to make the overall top 10 there are encouraging signs of improvement. The Thomson Reuters Foundation poll, carried out in partnership with Deutsche Bank, the Global Social Entrepreneurship Network (GSEN) and UnLtd, which are foundations for social entrepreneurs, ranked Australia 28th overall. The poll asked 900 experts in 45 of the world’s biggest economies a series of questions relating to the business-for-social-good sector, ranking the countries accordingly. The United States ranked highest in the overall poll, with Canada, Britain, Singapore, and Israel also in the top five. Turkey ranked lowest, scoring poorly in most of the 12 indicators used to measure political, economic, regulatory and cultural factors. Some 85 per cent of experts felt the social business sector was growing and gaining momentum globally, but most cited three major obstacles to sector growth; a lack of public awareness, access to investment, and government support. On the issue of sector growth and momentum Australia came in at number three (equal third with Singapore and India) with a score of 89.6 per cent after America and Canada. On the issue of government involvement, the experts said the sector needed coordinated government support and ranked Australia at 36th. Poll expert, and the director of the Centre for Social Impact at Swinburne University of Technology in Australia, Professor Jo Barraket told Pro Bono Australia News it was a “hot-button issue right now”. There is a strong sense that there’s not a lot of government support,” Barraket said. “Ranking equal third on momentum indicates where [Australia] is at really. I think there is a growing energy for growth in social entrepreneurship. The 2010 FASES report showed quite clearly that it wasn’t new practice but it has certainly got renewed interest and we are seeing new forms. 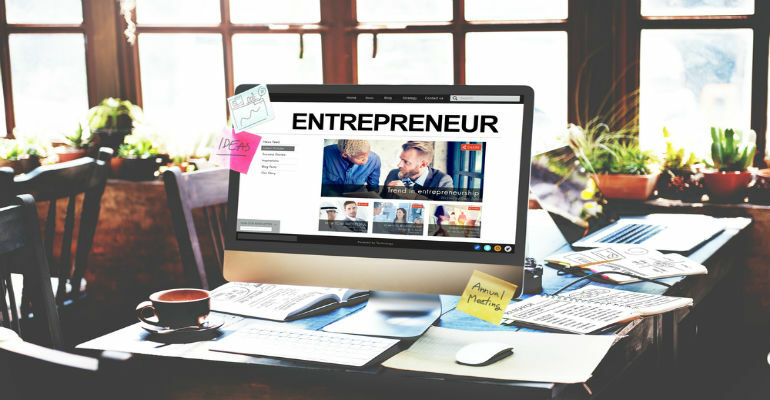 On the poll question of whether it was easy for social entrepreneurs to sell to the public, Australia came in second with a score of 72.9 per cent. Australia was also highly ranked at number three on whether social entrepreneurs can make a living from their work with a score of 68.8 per cent. On whether conditions were favourable to start and grow their businesses, the score was 60.4 per cent (rating 21st in the world). “This is a perception poll. I can’t really account for rating so well on that [ease of selling to the public] but possibly it reflects increasing public awareness of social enterprise and also mainstream media is starting to pick up on telling more stories about social enterprise,” Barraket said. On the issue of access to non-financial support that entrepreneurs need, Australia scored 62.5 per cent and 19th in world ranking. Barraket said Australia needed a broader spectrum of social finance and options for social enterprises. “Impact investing is not the answer for a social enterprise where ‘purpose’ is built into its business model and it is never going to generate a large amount of profit because the benefit is in their business model and their financial sustainability is in the ‘break even’,” she said. The poll found that 68 per cent of experts felt women were well represented in management in social enterprises, but less than half thought that women were paid the same as men. Australia ranked 15th as the best place to be a female entrepreneur with an above average score of 70.8 per cent. Asian countries fared best taking into account representation in leadership roles and the gender pay gap, with Philippines leading the way. “I am interested in this [result] because Australia is not fantastic on gender equity in the workforce or entrepreneurship broadly. So I don’t know what is driving that except that there are clearly a number of high profile, high performing women who are social entrepreneurs and also a number of senior women, and specialists in the third sector more broadly, who are probably giving a voice and a face to social entrepreneurship and that’s begin equated with opportunities for women,” Barraket said. A lack of public awareness and understanding generally was perceived to be the greatest obstacle to sector growth among experts, a problem exacerbated by varying definitions of social entrepreneurs across the globe. The experts said boosting public understanding could build greater awareness and put pressure on governments and financial institutions to support social enterprises which only have specific legal status and tax breaks in some countries. “Individual enterprises are finding a niche and finding they can engage the market and sell their products or services,” chair of Impact Investing Australia Rosemary Addis said in response to the poll. “But as a sector, the concept of social enterprise and purpose-driven business has not yet got mainstream awareness.